Succor has finally come the way of veteran Nollywood actor, Martins Njubuigbo, popularly known as Elder Maya as his medical bills have been sorted out by popular Abuja pastor, Joshua Iginla. Reports have it that Elder Maya, who is arguably the longest surviving Nigerian actor, is down with a liver-related problem as the actor is down with a swollen leg and stomach which causes him pain. 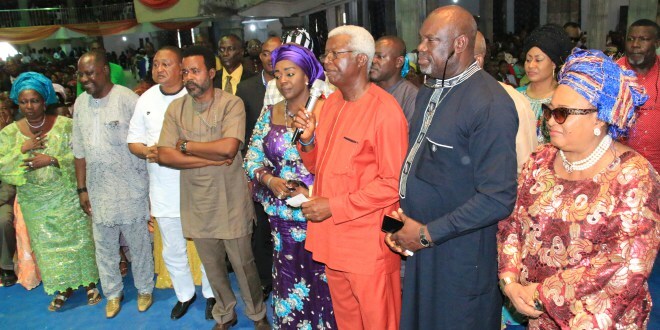 But on Sunday May 22, 2016 during the birthday ceremony of the clergy man, one of the colleague of the aged actor told the man of God about Elder Maya's condition and the fact that he needs about #800,000 naira to undergo operation and that some of his colleagues have been soliciting for funds from good Samaritans. Upon hearing this, Brother Iginla frowned at the move of his colleagues to beg for fund to save Elder Maya's life. He immediately wrote a cheque of one million naira for the man and also promised to look into his situation ones he gets back on his feet. 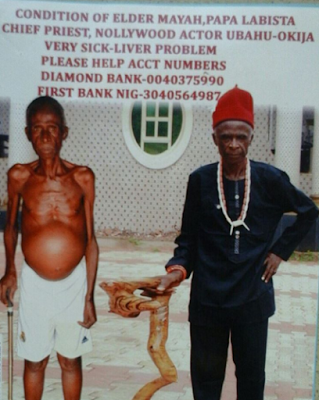 The actor, fondly called Papa Labista, who is popular for his village chief priest’s roles in movies, was reportedly diagnosed with liver disease at an undisclosed hospital in Lagos State. This was disclosed by his fellow colleague, actor Ernest Obi, through his Instagram account.